Kettler balance bikes are aimed at children aged 2-4 in the core balance bike age range, and with several different bikes in their range, Kettler is an excellent brand to consider when you are looking for the best balance bike for your child. The entry level Kettler balance bike is the Kettler Speedy Balance bike, which provides a great value option and a very good bike to get your toddler on the move. The bike is well constructed with a sturdy steel frame (although it does require some construction out of the box), but this means that the bike is likely to stand the test of time with a scratch resistant finish. 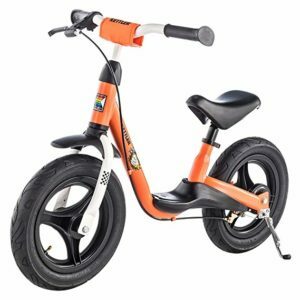 All of the basic features of a good value balance bike are included, with a padded, adjustable seat and a safety handlebar, which is useful for when the bike is dumped on the ground. The seat can be adjusted from 33 - 43cm, so while this may make the Kettler Speedy Balance bike a little too big for the average 2 year old, the large range of seat heights mean that this bike should see your child through to a proper pedal bike. If you are shopping for a child approaching their 2nd birthday, then read our guide to the best balance bikes for 2 year olds. The Kettler Speedy Balance Bike also comes equipped with a hand brake, which is not always found on bikes in this price category. This can save a lot on the wear and tear of your child's shoes as they won't need to use their feet for braking! 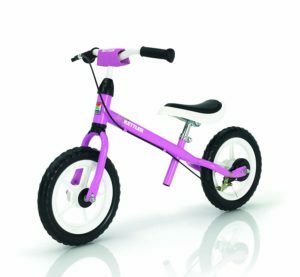 The Kettler Speedy Balance bike is available in different colours and sizes, including the Kettler Speedy Pablo 12.5” model. This bike has larger wheels, so it is suitable for slightly older children and the handlebar does not have a turning limiter. This bike is available for around £60. The Kettler Speedy Balance bike weighs in at 4.1kg, so this lines up with the fact that we would recommend these bikes to children aged 2 and a half or older as a 2 year old may find this difficult to handle. At around £45, the Kettler Speedy Balance bike will give you everything you need from a starter bike with all of the features you will need and a little bit more. If you are sold on a Kettler balance bike, then it may be worth spending an extra £20 or so for the next model in their range which is the Kettler Spirit Air balance bike. This bike features a step through frame with a running board, for safely boarding and dismounting the bike. This feature is only usually found on bikes for the youngest children, but if your 3 or 4 year old is new to balance bikes this will make it easier for them to get going. The steel frame is scratch resistant and durable, and the bike also features ball bearing mounted, 12.5” wheels with pneumatic tyres for a comfortable ride. Safety features include a handlebar with rear brake and there is also a parking stand so your child can enjoy “parking” their bike when they are not using it. The Kettler Spirit Air Balance bike is available for around £80 and weighs 6.3kg. The heavier weight of this bike means that it would probably be most suitable for children that are slightly older as it would be difficult for a 2 year old to handle. The final model to feature in the range of Kettler balance bikes is the Kettler Run Air balance bike. This has a similar design to the Spirit Air bike, with the step through frame and a running board included. The ergonomic seat is also a feature of this bike, and the saddle can be adjusted from 37cm – 46cm. Additional features include the 12.5” spoke rims, safety handlebar with brake and the park stand. 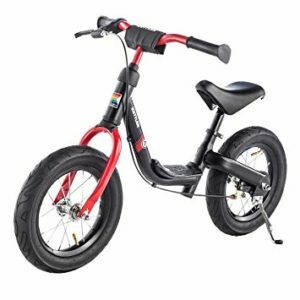 The Run Air balance bike is available in a sporty black and red design or a stylish purple and green. Kettler balance bikes cater for children of all ages, from the very youngest children with the Kettler Speedy through to sportier models like the Run Air balance bike.